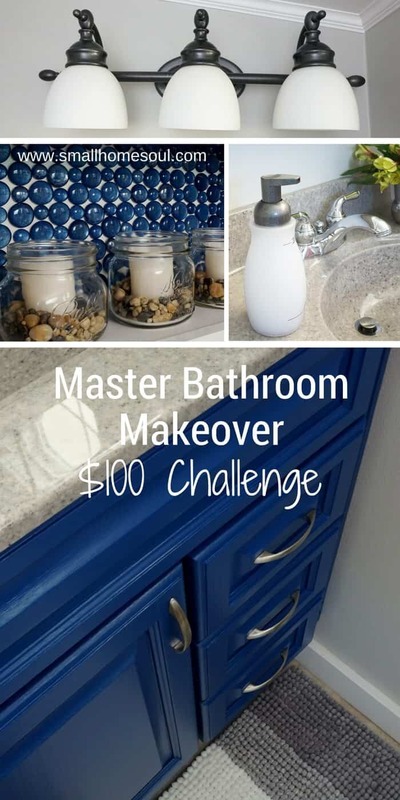 Master Bathroom Makeover Reveal - on a $100 Budget - Girl, Just DIY! 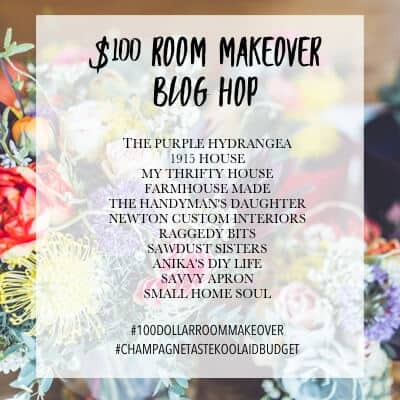 When you’re done reading my post be sure to click the blogs at the bottom and hop on over to my blogger friend to see what wonderful room makeover they created with $100! Before I show you my completed Master Bathroom Makeover let’s review what I started with. I’ll show you the pics, you can use the link above to read the full backstory. Builder beige, ugh, and we did that to ourselves. Brown on brown, not super inspiring. Sad little clock and some forgotten candles. 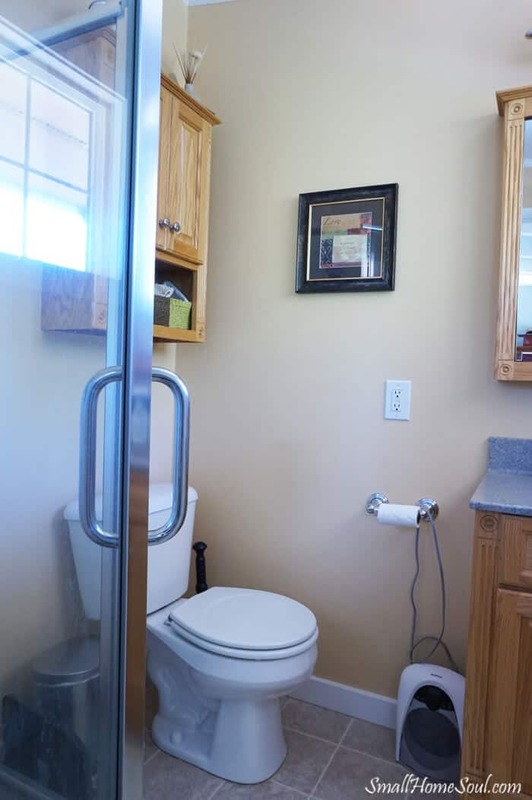 Yep, that’s it, it’s a tiny bathroom. And it was b-o-r-i-n-g!!!! 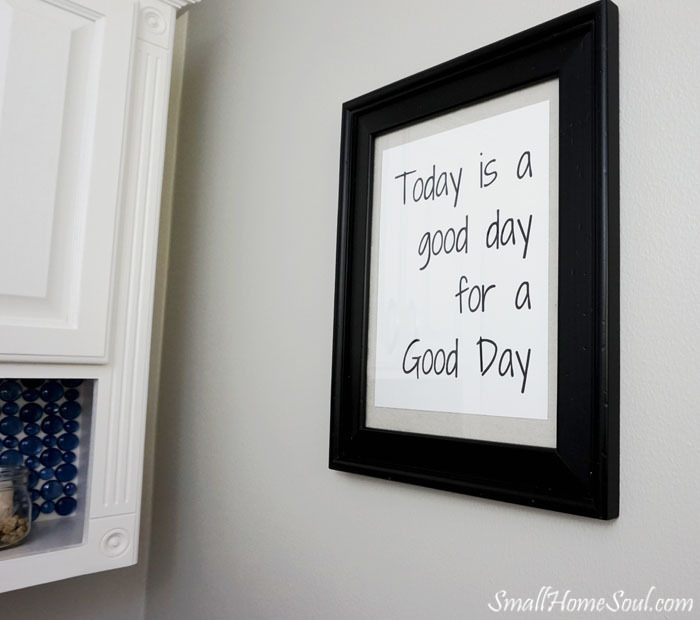 I think I mentioned already that most of the makeover consisted of paint; but, I also did a few crafty projects to add an extra bit of glamour to my very small bathroom. You’ll see them in the pictures below. Then, over the next few weeks I’ll highlight a few of the features in the bathroom in more detail. 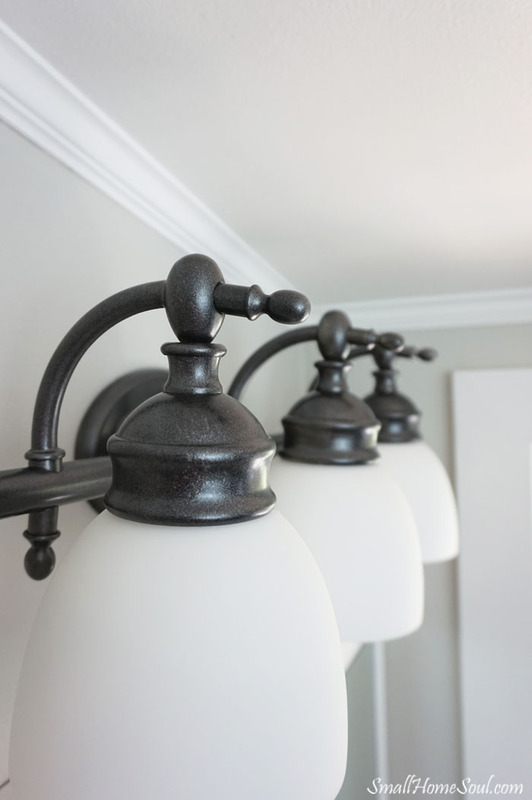 I hope they inspire you to undertake your own master bathroom makeover. Here’s how it breaks down. If I had to purchase it the for the project my cost is listed next to it. The grand total before tax comes to $97.24. Since we all live in different states with different tax rates we decided it was the most fair to exclude tax. Thankfully Sherwin Williams was having a 40% off sale when I bought my paint. I’ll take you all around the room now so please do try to keep up 🙂 Without further delay here’s my new, updated, and totally awesome bathroom! I love everything about it, but I have a few favorites that I’ll highlight for you. This newly updated light!! Who knew getting an elegant light would be so easy? Isn’t the blue on that cabinet just the best? And that new rug from Home Goods feels so good on my bare toes. Are you keeping up? There’s a whole lot more to show you, like the updated TP Cabinet and some new decor. That’s it, tour’s over ….. bwahahaha I crack myself up 🙂 Remember me telling you it’s a small bathroom? I wasn’t lying. I didn’t show you the shower because I didn’t do any updates to it, and because I’d have to put a letter outside the window to get a decent picture of it. That’s the struggle of a 6’x6′ bathroom, but I’m thankful to have it. Now let me highlight some of the other stuff I love. Like the giant clock that used to be in the guest bath, I decided I needed this prettiness in my bathroom. I scored this beauty at Home Goods a few years ago. Yes I love that store and browse there often! You can find similar twin bell clocks online if you don’t stumble upon one at their store. And I love the faux IKEA plants, they always look great and they never die. This one’s been all over the house but I think it’ll live here now too. 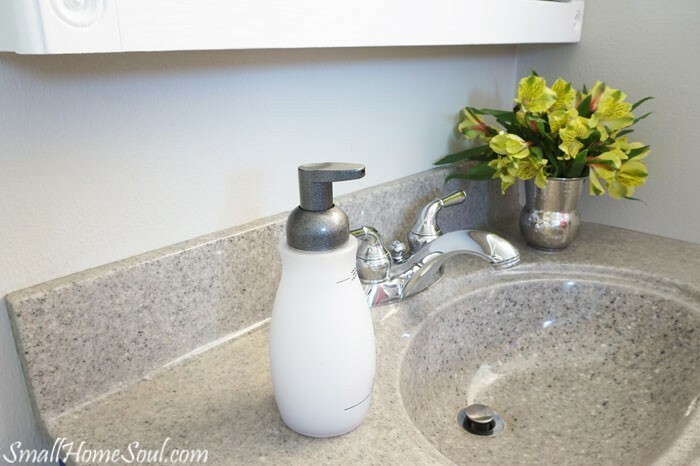 I even did a little makeover to the foaming soap dispenser that I used in this bathroom for a long time. It was ugly and brown with a clear plastic jar before I got my hands (and spray paint can) on it. I gave it the same treatment I gave the light, wait until you see a close up of the light! But first let me show you the new bathroom artwork. Well, not artwork exactly but I love it like it’s artwork! I love this saying, I first heard it while watching an episode of Fixer Upper and it quickly became one of my favorites. And I chose a black frame because I heard a designer say once that every room needs a little bit of black to help ground it. I think it does just that, and nicely. OK, OK, I’ll show you the lights now 🙂 If you remember from the master bath preview this light was chrome before. The finish was a bit etched from so many years in the bathroom. I think you’ll agree that the specialty paint job I gave it is a huge improvement. It looks like a whole new fixture and the light makeover was really easy. HA, you can see the top of my head in the pic above, it sure is hard taking pictures around mirrors. And one last pic of the light, one of my favorites…. And I almost forgot to show you the new hardware. I filled all the holes in the vanity and the TP cabinet and drilled new holes for the new pulls. These are such an improvement over the tiny knobs. I learned a cool trick via a Pinterest Pin for drilling perfectly spaced holes. And another shot of that beautiful new rug. I hope you loved our my master bathroom makeover as much as we do! Especially like the white treatment you’ve given to the wooden cabinet and the new clock and planter on top. What a great achievement – so many things to love! 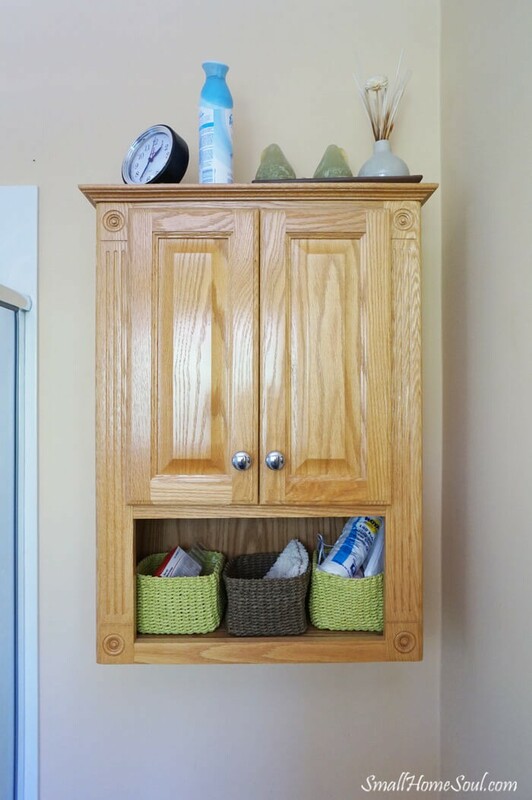 Hi Julie, thanks so much, the cabinets needed an update and I love them all now! Goodness, Toni, I LOVE it! That blue is so gorgeous, especially with the gray walls and white. So fresh and pretty! Thank you Kimm, I do love the blue! I just love your new bathroom! WOW, what an amazing transformation. 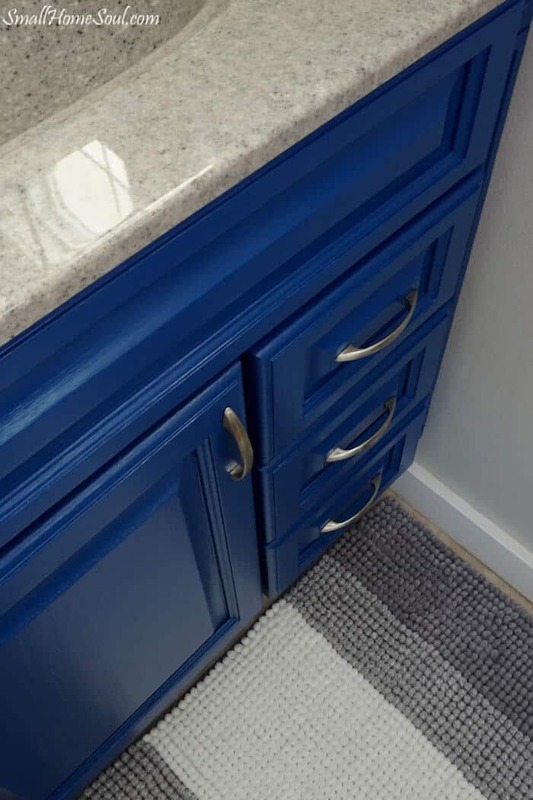 That color blue is stunning and I love what you did with the cabinets. I love the glass beads what a great idea! You need to win the award for the most dramatic makeover girl! Terrific job! Thank you Carolann, I am in love with it now! Your little bathroom looks so awesome!! You gave it a totally new look. 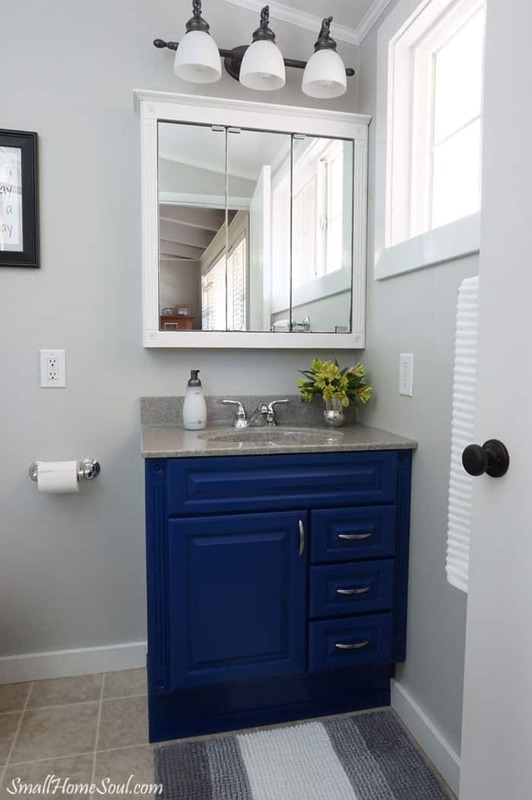 I love the blue on the vanity and the blue “backsplash”. Such a clever use of something you had just lying around. Hoarding is sometimes good, right? 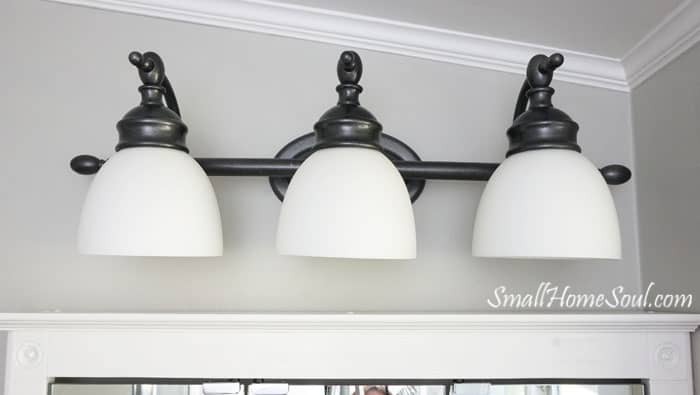 The light fixture looks like new and now stands out. I honestly didn’t even notice it in the before photo. Great job and totally inspired to do some updates around my house!!! Great transformation! I remember that saying from FIxer Upper and loved it . Visiting from BOB Traibe. 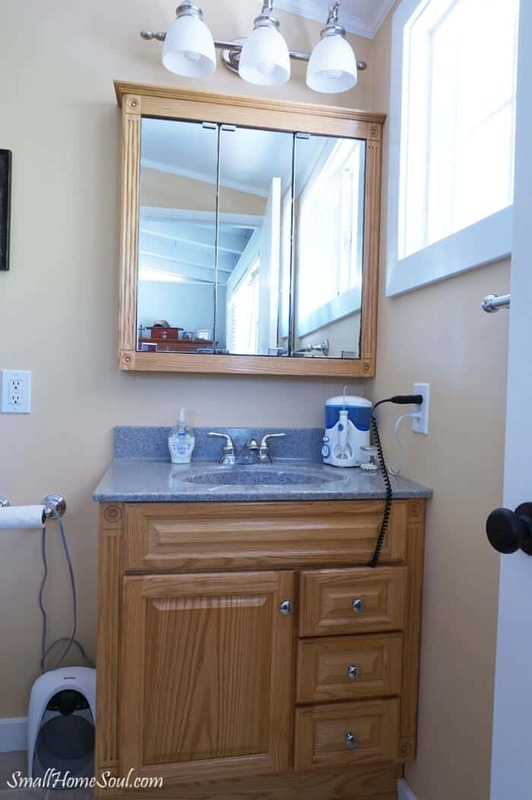 The bathroom came out great. I love all of the details you incorporated into it. And the blue cabinet is the focal point. Love it. What a FABULOUS transformation!!! LOVE everything!! 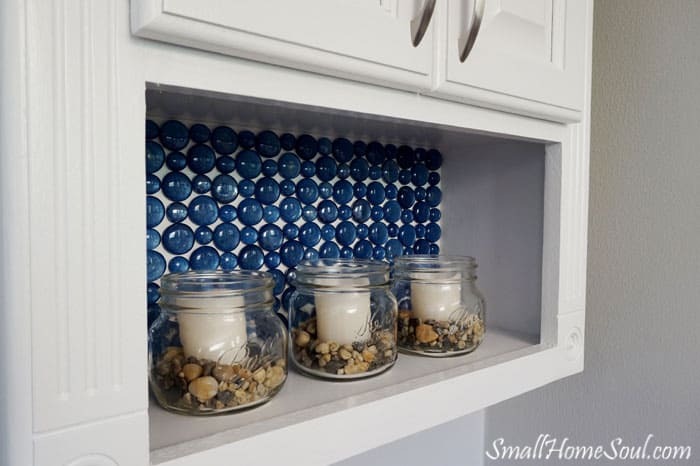 Your light turned out awesome and love the blue glass beads you used on your cabinet! 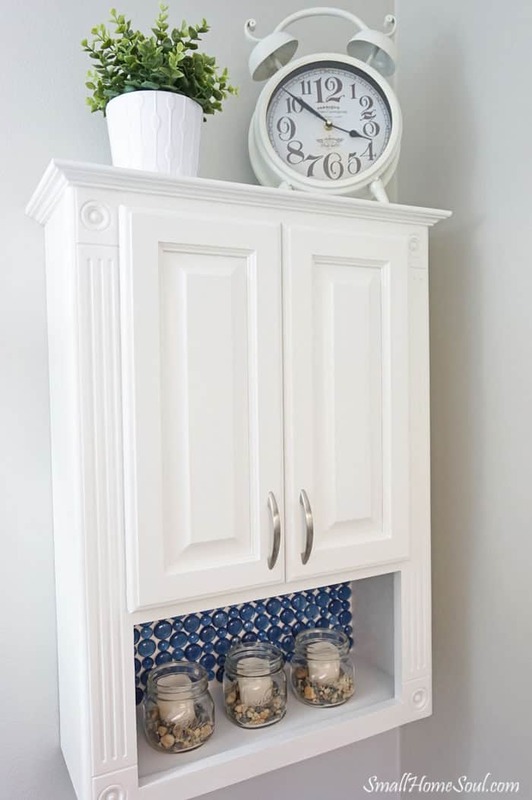 Ties your gorgeous blue cabinet in perfectly! Well done !! LOVE IT!! !I have been a fan of the blue ever since you gave a glimpse of it… but that backsplash is just genius… And I love your choice of grey for the walls… The entire bathroom looks amazing!!! And all that decor is just spot on! The blue cabinet really does pop. It’s gorgeous and I need to paint something that color now. Your bath transformation turned out beautiful! 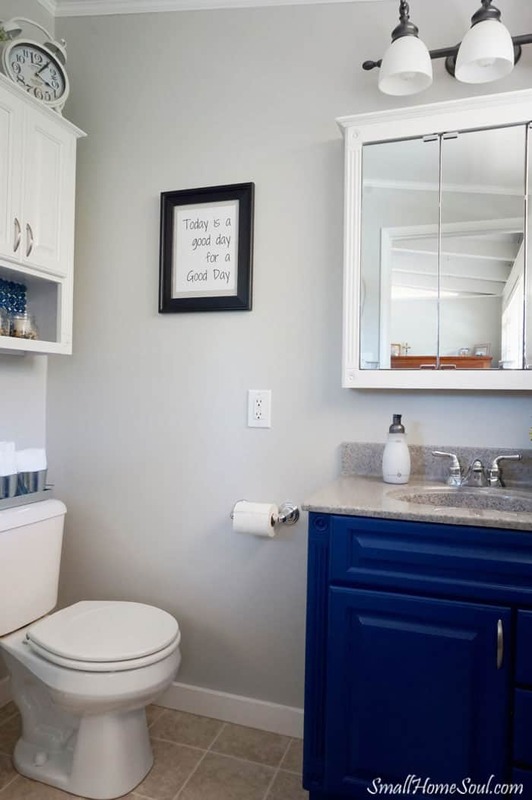 Wasn’t too sure about that bold blue, but it looks great with the white cabinets! I feel inspired to do my bathroom now! Oh my GOSH Toni! First of all, you take gorgeous photos. So bright and pretty. That backsplash was perfection! LOVE it ALL! Toni….I love the blue cabinet. 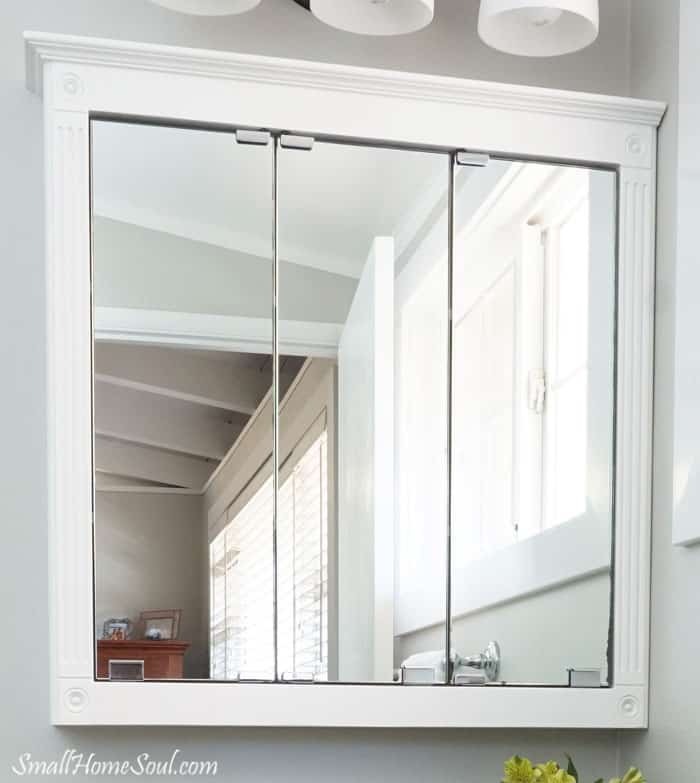 It really pops and makes a bold statement in your cute bathroom. You did such a great job with all the extra details like those glass beads! Awesome job my friend. Wow great transformation, loving the blue cupboard. Thank you Claire, it doesn’t even look like the same room. Toni!!! You did such a great job in here!!! The blue is so fun and I love your glass backsplash in your medicine cabinet!! Way to think outside the box!!! 😀 <3 Cheers, girl!!! 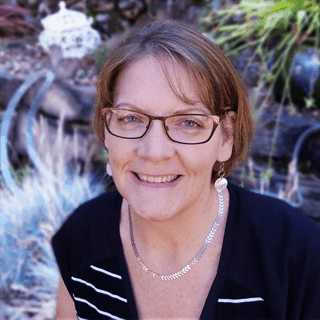 Thank you sweet Susie, it is hard to pick sometimes, isn’t it? Thank you Kathleen, I love the gray also. I was so glad I convinced my husband to use it in the rest of the house also. It really is a great and neutral backdrop for so many other colors. This is truly magnificent Toni!! I love that shade of blue on the cabinets and that lighting is to die for!! Thank you Medina, I really love the blue! At first I wanted a deeper shade but I think this one is just right. And, yes, that light, I love it now! !